@TinDogPodcast reviews the superb #THETIMEMACHINE from @BigFinish by #HGWELLS This title was released in September 2017. It will be exclusively available to buy from the BF website until October 31st 2017, and on general sale after this date. Imagine a man who defies convention. A man prepared to risk everything to push science to its limits. Imagine a far distant future where humanity has changed beyond recognition. Where peace may come at a terrible cost, and where violent creatures lurk beneath the surface of the Earth. Imagine a leap into the unknown, into discovery and adventure. Imagine a journey in... The Time Machine. Producer David Richardson Script Editor Nicholas Briggs Executive Producers Jason Haigh-Ellery and Nicholas Briggs Written By: HG Wells, dramatised by Marc Platt Directed By: Ken Bentley Cast Ben Miles (The Time Traveller), Nicholas Rowe (Mr Wells), Anjella Mackintosh(Uweena), Nicholas Asbury (Mr Filby), James Joyce (Mr Pollock), Hywel Morgan(Morlock Leader), Christopher Naylor (Mr Naylor). Other parts played by members of the cast. @TinDogPodcast reviews The planet Dashrah is a world of exceptional beauty. Historical ruins; colourful skies; swirling sunsets... Unsurprisingly, it's a major tourist trap. So if you want to visit Dashrah, first you'll have to visit Parking, the artificial planetoid that Galactic Heritage built next door. Parking, as its name implies, is a spaceship park. A huge spaceship park. A huge, enormous spaceship park. When the TARDIS materialises in Parking's Northern Hemisphere, the Doctor, Ace and Mel envisage a quick teleport trip to the surface of Dashrah. But they've reckoned without the superzealous Wardens, and their robotic servitors... the sect of the Free Parkers, who wage war against the Wardens... the spontaneously combusting spaceships... and the terrifying secret that lies at the lowest of Parking's lower levels. Written By: John Dorney Directed By: Ken Bentley Cast Sylvester McCoy (The Doctor), Sophie Aldred (Ace), Bonnie Langford (Mel Bush), Gabrielle Glaister (Cowley), Hywel Morgan (Kempton/ Tribesman), Kate Duchene (Regina/ Seraphim), Leighton Pugh (Fulton), Jack Monaghan (Dunne/ Selfdrive), James Joyce (Robowardens). Producer David Richardson Script Editor Alan Barnes Executive Producers Jason Haigh-Ellery and Nicholas Briggs This title was released in July 2017. It will be exclusively available to buy from the BF website until August 31st 2017, and on general sale after this date. @Tindogpodcast reviews This title was released in July 2017. It will be exclusively available to buy from the BF website until August 31st 2017, and on general sale after this date. Shipwrecked in the South Pacific, Edward Prendick finds unlikely salvation in the company of Montgomery - a disgraced medic bound for distant shores, in charge of an unusual cargo. Their destination is a mysterious jungle isle where the night is split by terrible cries, and where inhuman creatures walk upright on two legs. When Prendick meets the man who lays down the law, he realises that his nightmare is only just beginning. For this is... The Island of Doctor Moreau. (Comes with a free Extended Extras download exclusive to Big Finish Listeners - just check out the Supplementary section of this title in your account) Producer David Richardson Script Editor Matt Fitton Executive Producers Jason Haigh-Ellery and Nicholas Briggs Written By: HG Wells, dramatised by Ken Bentley Directed By: Ken Bentley Cast Ronald Pickup (Doctor Moreau), John Heffernan (Edward Prendick), Enzo Cilenti(Montgomery), David Shaw-Parker (Captain/ Constans), John Banks (Mate-LV/ M'Ling/ Satyr-Man), Tim Bentinck (Helmar/ Captain John Davies/ Ape-Man), Daniel Goode (Seaman/ Mate-I, Dog-Man). Other parts played by members of the cast. 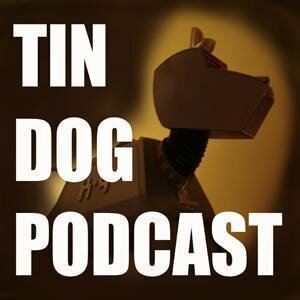 @TinDogPodcast talks about the news Jodie Whittaker has been announced as Doctor Who's 13th Time Lord - the first woman to be given the role. The new Doctor's identity was revealed in a trailer broadcast at the end of the Wimbledon men's singles final. The Broadchurch star succeeds Peter Capaldi, who took over the role in 2013 and leaves in the forthcoming Christmas special. Whittaker, 35, said it was "overwhelming, as a feminist" to become the next Doctor. She will make her debut on the sci-fi show when the Doctor regenerates in the Christmas special. All the Doctors so far, from Hartnell to Whittaker Time Lord's new gender splits Doctor Who fans The Huddersfield-born star, who was a late favourite to become the Doctor, will find a familiar face for her on set - Doctor Who's new showrunner is Broadchurch creator Chris Chibnall. Whittaker said: "I'm beyond excited to begin this epic journey - with Chris and with every Whovian on this planet. "It's more than an honour to play the Doctor. It means remembering everyone I used to be, while stepping forward to embrace everything the Doctor stands for: hope. I can't wait." The actress also shares another Broadchurch link with Doctor Who - co-star David Tennant was the 10th Doctor. Analysis Jodie Whittaker By Lizo Mzimba, BBC entertainment correspondent It was always unlikely that the Doctor would continue to be white and male, especially as the BBC has committed itself to greater diversity on its programmes. Casting the first female Doctor is something many viewers have been calling for. And strong female-led stories have been successful on the big and small screen in recent years, in films ranging from The Hunger Games and Star Wars to Wonder Woman, and in TV series like Game of Thrones. The BBC will be hoping today's announcement will not just excite viewers, but will also demonstrate that the time travel show has firmly moved into the 21st century. Whittaker said it felt "incredible" to take on the role, saying: "It feels completely overwhelming, as a feminist, as a woman, as an actor, as a human, as someone who wants to continually push themselves and challenge themselves, and not be boxed in by what you're told you can and can't be." And she told fans not to be "scared" by her gender. "Because this is a really exciting time, and Doctor Who represents everything that's exciting about change," she said, adding: "The fans have lived through so many changes, and this is only a new, different one, not a fearful one." Whittaker said she had used the codename "Clooney" when discussing the part with her husband and agent - as actor George is "an iconic guy". Peter Capaldi and David Bradley Image caption Peter Capaldi will bow out in this year's Christmas special, featuring David Bradley as the First Doctor Chibnall said the 13th Doctor was always going to be a woman. He said: "I always knew I wanted the 13th Doctor to be a woman and we're thrilled to have secured our number one choice. "Her audition for the Doctor simply blew us all away. Jodie is an in-demand, funny, inspiring, super-smart force of nature and will bring loads of wit, strength and warmth to the role. The 13th Doctor is on her way." Chibnall is taking over from Steven Moffat, who leaves the series at the same time as Capaldi. Capaldi, who had said he wanted to see a woman replace him, said: "Anyone who has seen Jodie Whittaker's work will know that she is a wonderful actress of great individuality and charm. "She has above all the huge heart to play this most special part. She's going to be a fantastic Doctor." TDP 690: What Do I Do Next? @TinDogPodcast reviews "The Doctor Falls" Notes from wiki Rachel Talalay Steven Moffat 1 July 2017 TBD 83 Escaping to the next floor of the ship, the Doctor tries to comfort Bill, who has retained her humanity, though this is wearing thin. This floor of the ship is a simulated countryside, where the group helps defend the villagers from the oncoming Cybermen. Knowing they are overwhelmed, the Doctor attempts to convince Missy and the Master to help him. They refuse, though Missy seems conflicted. Hoping to save the villagers, the Doctor tells Nardole to take them to another floor while he sacrifices himself. Bill opts to stay with the Doctor, and Nardole says goodbye, taking the villagers to safety. Elsewhere, before escaping to their TARDIS, Missy betrays the Master to help the Doctor by stabbing him in the back, triggering the regeneration process. He shoots her in return, killing her. The Doctor fights off the Cybermen, but is shot by the now fully-converted Bill. He proceeds to blow up the whole floor, killing himself. Bill somehow survives, with Heather appearing before her. They kiss, and Heather reveals she changed Bill into her species so she could live on. The two take the Doctor back to his TARDIS, Bill using her species' healing powers to bring him back before she and Heather leave to see the universe together. The Doctor awakens as the regeneration process begins. He refuses, attempting to stop it, and exits the TARDIS onto an icy planet, where he is greeted by the First Doctor. @tindogpodcast reviews from wiki 275a 11 "World Enough and Time" Rachel Talalay Steven Moffat 24 June 2017 TBD 85 In a snowspace, the Doctor stumbles from the TARDIS and regenerates. Earlier, the Doctor proposed to test Missy by having her answer a distress call. They arrive via TARDIS on a colony ship reversing away from a black hole. They are held at gunpoint by Jorj, who demands to know which of them is human, and Jorj shoots Bill. The Doctor, Missy, and Nardole learn that a few days ago, some of the crew had gone down to the ship's bowels but never returned. Jorj claims the ship was other empty, but the Doctor shows there's thousands of humans, the first crew descendants: due to time dilation, time moves much faster at the ship's bowels. Bill awakens in a hospital, having been fitted with a replacement heart. Razor, the hospital caretaker, explains that some of the patients are waiting to be "upgraded" to escape the ship's polluted air. Years later, they see footage of the Doctor coming down the lift, having only been a few minutes for him. The Doctor, Nardole and Missy arrive to determine the origin of the colony ship: Mondas. Razor approaches Missy and reveals himself to be her previous incarnation, formally known as the Master. The Doctor and Nardole find a Cyberman who reveals itself as Bill. The Eaters of Light" is the tenth episode of the tenth series of the British science fiction television series Doctor Who. It is written by Rona Munro and was broadcast on 17 June 2017 on BBC One. "The Eaters of Light" sees the return of a writer from the classic era of the programme, making her the only writer to date to have worked on the classic and revived eras of the show; the episode received mixed reviews from television critics. The Doctor (Peter Capaldi) takes Bill (Pearl Mackie) and Nardole (Matt Lucas) to the Scotland in the second century to settle their different theories about what happened to the ninth legion of the Roman army that vanished. When they arrive, however, they find an alien menace from another dimension that may be the reason behind the vanishing, but is a far greater threat than any army. @TinDogPodcast reviews Kate Stewart and her UNIT team investigate and confront alien attacks on the planet Earth. Something is stirring, an old foe to those in UNIT with a long memory. And fortunately, to face an old foe... There are old friends. 4.1 Call to Arms by Matt Fitton Mike Yates braves a stormy night in the Lakes to help celebrate a milestone for John Benton. An evening of fond reminiscences of old glories and friends awaits. But a long-buried past is about to catch up with them. Meanwhile, on the rain-lashed moors, what begins as a routine mission for modern-day UNIT quickly becomes a fight for survival. 4.2 Tidal Wave by Guy Adams When an experimental tidal power generator needs its eco-friendly credentials checked, Kate Stewart calls in an expert. Soon, Jo Jones is bound for 'Project Charybdis' in the South Atlantic, along with an awestruck Osgood. But out at sea, a treacherous plan is set in motion to awake an ancient race. Beneath the seabed an army is sleeping - an army of Sea Devils! 4.3 Retrieval by Guy Adams As the Earth's primeval rulers reclaim their birthright, UNIT must stand against them. Kate Stewart and Osgood venture into a Mediterranean stronghold to retrieve a means to fight back. But a Silurian warrior is on their trail. Once she has the humans' scent, Commander Tryska will never give up the hunt. 4.4 United by Matt Fitton The Silurians hold Great Britain under siege. Grand Marshal Jastrok rules the seas and the skies with reptile forces. On the ground, Commander Kalana crushes all ape resistance. With Kate Stewart trapped, defence of the realm falls to UNIT's old guard. Jo Jones, Mike Yates and John Benton are ready to do their duty and stand united. Deploying May 2017 Written By: Matt Fitton, Guy Adams Directed By: Ken Bentley Cast Jemma Redgrave (Kate Stewart), Ingrid Oliver (Osgood), James Joyce (Josh Carter), Warren Brown (Lt. Sam Bishop), Richard Franklin (Mike Yates), John Levene (John Benton), Katy Manning(Jo Jones), Richard Hope (Jastrok), Neve McIntosh (Kalana), Nicholas Briggs (Sea Devils), Nicholas Asbury (Burmaster), Annette Holland (Anne), Alex Tregear (Laura Sale). Other parts played by the cast. Producer David Richardson Script Editor Ken Bentley Executive Producers Jason Haigh-Ellery and Nicholas Briggs This title was released in May 2017. It will be exclusively available to buy from the BF website until July 31st 2017, and on general sale after this date. Empress of Mars" is the ninth episode of the tenth series of the British science fiction television series Doctor Who. It is written by Mark Gatiss and was broadcast on 10 June 2017 on BBC One. "Empress of Mars" received generally favorable reviews from television critics. The Doctor (Peter Capaldi), Nardole (Matt Lucas), and Bill (Pearl Mackie) travel to Mars, but upon arrival, they find themselves in the middle of a conflict between the Ice Warriors and Victorian soldiers. The episode marks the return of the Ice Warriors, last seen in "Cold War", an episode of the seventh series that was also written by Gatiss. Contents [hide] 1Synopsis 1.1Continuity 1.2Outside references 2Production 2.1Writing 3Broadcast and reception 3.1Critical reception 4References 5External links Synopsis On Earth 2017, NASA finds the words "God save the Queen" made of rocks buried under the ice cap of Mars. The Doctor, Bill and Nardole venture to Mars in 1881 to investigate, and they discover that the planet is occupied by human soldiers from Victorian Britain. Nardole goes back into the TARDIS, but it departs for unexplained reasons, returning to the university in present day. Nardole has to ask Missy for help getting back. The humans have befriended an Ice Warrior they have named Friday. Captain Catchlove says they rescued Friday from his crashed spaceship while on patrol in Africa. In exchange, Friday allowed the soldiers to use his species' technology to travel to and mine Mars. The Doctor surmises that Friday is using them to access to his hive. They soon unearth the tomb of the Ice Queen. Despite Colonel Godsacre's order to not approach it, one guard cuts a crystal from the base of the tomb which revives the Ice Queen, Iraxxa. Iraxxa's waking leads to a confrontation with the humans. Friday tells Iraxxa it has been 5,000 years, and Mars' surface is uninhabitable; the Doctor asks Iraxxa to show mercy and gain help from the humans. Dismissing the Doctor and the soldiers, she asks Bill for her opinion, as a fellow woman. She decides to relent based on Bill's word, but then a soldier suddenly fires his rifle, the shot harmlessly glancing off Iraxxa's helmet. Provoked, she returns fire. Catchlove takes command, locking up the Doctor, Bill, and Godsacre, and traps Iraxxa and Friday within the tomb, where they start reviving more Ice Warriors. As the Ice Warriors launch their attack, Friday allies himself with the Doctor and Bill and helps the Doctor gain control of the mining device. The Doctor threatens to use it to bury all under the ice cap. Catchlove holds Iraxxa at knifepoint and attempts to force her to help him pilot a spaceship back to Earth. Godsacre manages to surprise Catchlove and kills him, then begs Iraxxa to kill him. Iraxxa calls off the attack in exchange for Godsacre pledging himself to the Ice Warriors. The Doctor covertly contacts Alpha Centauri to assist the Ice Warriors. The Doctor and Bill help Godsacre leave the message that NASA will discover. Nardole re-appears with the TARDIS. Missy is also on board and expresses concern about the Doctor's health. Continuity The Doctor's sonic screwdriver still has "no setting for wood", a defect first mentioned in "Silence in the Library". The portrait of Queen Victoria displayed resembles Pauline Collins, who played the role in "Tooth and Claw". Outside references Friday is named after the character "Friday" from Daniel Defoe's Robinson Crusoe. Bill mentions the movies The Terminator and The Thing, and the Doctor refers to the film Frozen. Upon the discovery of the Ice Empress' tomb, the Doctor says "I've got a bad feeling about this," a recurring phrase in the Star Wars franchise. Production The read-through for "Empress of Mars" was on 11 January 2017. Filming with the previous episode "The Lie of the Land started on 27 January, with principal shooting ending on 22 February. Writing The story was originally to have been set on Peladon rather than Mars, hence the return of Alpha Centauri after 43 years.It was also reported to have originally been planned as a sequel to the ninth series episode " Sleep No More", also by Mark Gatiss, referenced in the line delivered by the Ice Empress exhorting her warriors to "sleep no more". Broadcast and reception The episode was watched by 3.58 million overnight. It received an AI of 83. Critical reception Professional ratings Review scores Source Rating Rotten Tomatoes (Tomatometer) Rotten Tomatoes (Average Score) The A.V. Club Entertainment Weekly SFX Magazine  TV Fanatic IndieWire IGN 8.2 New York Magazine Radio Times  Daily Mirror  "Empress of Mars" received generally favorable reviews from television critics. @TinDogPodcast reviews The Lie of the Land" is the eighth episode of the tenth series of the British science fiction television series Doctor Who. Written by Toby Whithouse, it was broadcast on 3 June 2017 on BBC One. "The Lie of the Land" received mixed to positive reviews from television critics. Continuing on after Bill (Pearl Mackie) gives her consent to the Monks, she and Nardole(Matt Lucas) have to find a way to rescue the Doctor (Peter Capaldi) after he is imprisoned, and end the Monk's invasion of Earth. It is the third and final of three loosely connected episodes called "The Monks Trilogy". Synopsis The Monks are rulers of the Earth, and appear to have been on Earth for millions of years, guiding human development. Bill and a few others are aware of the truth: the Monks have only been present on Earth for six months. Those who hold this view are imprisoned for "memory crimes". The Doctor appears on television praising the Monks' guidance over humanity. Bill keeps herself grounded in reality by imagining that she is talking with her long-dead mother, based on pictures the Doctor gave her. Nardole, also aware of the truth, locates Bill and helps her to find the prison hulk where the Doctor is thought to be a captive. Inside, after a team of commandoes swarm inside, the Doctor tells Bill he is cooperating willingly with the Monks, believing that humanity was doomed without their guidance. Bill becomes distraught and shoots the Doctor, who appears to begin regenerating, but quickly stops. The entire scenario is revealed to have been a test by Nardole, the Doctor and the team, to make sure Bill was not under the influence of the Monks. At the university where the Doctor and Bill work, they enter the Vault to talk to Missy, who says she has encountered the Monks before. She confirms the Monks maintain control by broadcasting a signal containing the false history to their subjugated victims via the numerous statues they have built across Earth, enabled by a psychic link established through the person who originally gave "consent"; Missy claims she defeated them during her own encounter by killing that individual. The implication is that Bill must die as the one who gave consent on Earth. Believing there is another solution, the Doctor, Bill, Nardole, and the commandoes infiltrate the Monks' pyramid in London so that the Doctor can hijack their broadcast with his own mind to break the psychic transmission. In the central chamber, the Doctor attempts to link his mind to the controlling Monk, who after a struggle overpowers the Doctor. Bill intends to sacrifice herself, linking her own mind to the Monk's despite the Doctor's protests. The Monks' broadcast is replaced with images of Bill's mother, which the Doctor recognises is a strong and loving memory in Bill's mind. Humanity wakes up from the Monks' lies and revolts against them. The Doctor, Bill, and Nardole watch as the Monks abandon Earth. Sometime later, the Doctor and Bill find that most of humanity have no recollection of the Monks. In the Vault, Missy expresses remorse for those she has killed. Continuity In images showing the Monks' aid to humanity, clips from the stories "Blink", "Nightmare in Silver" and "Into the Dalek" are shown. Later a clip from the "The Pilot" was seen, as well as several still images from past episodes of the new series. Magpie Electrical, which first debuted in "The Idiot's Lantern" and recurs throughout the revival series, is shown as the shop where Bill watches one of the Doctor's broadcasts. Outside references Missy briefly plays selections from Eric Satie's Gnossienne No. 1 and Scott Joplin's "The Entertainer" on her piano. Production The read-through for "The Lie of the Land" took place on 11 January 2017. Filming took place, alongside the subsequent episode "Empress of Mars", from 16 January to 22 February 2017. In Missy's initial scene, the visual of her eyes superimposed over a panning shot is an homage to a similar scene from the 1996 film. Broadcast and reception The episode was watched by 3.01 million overnight, the series' lowest overnight rating in its history, after the rating of 3.10 million for Battlefield in 1989. This was due to the episode being placed directly against the Britain's Got Talent finale. It received an AI of 82. Critical reception Professional ratings Review scores Source Rating Rotten Tomatoes (Tomatometer) 90% Rotten Tomatoes (Average Score) 6.74 The A.V. Club B- Entertainment Weekly B SFX Magazine 5/5 stars IndieWire B IGN 8.7  New York Magazine 3/5 stars Radio Times 2/5 stars Daily Mirror 2/5 stars "The Lie of the Land" received mixed to positive reviews, with "a number reviewers finding it the weakest story in the season so far". The episode currently holds a score of 90% on Rotten Tomatoes, the site's consensus reading ""The Lie of the Land" closes a significant chapter for Doctor Who's tenth season -- yet leaves some major characters' fates tantalizingly open." @TinDogPodcast review The Pyramid at the End of the World was the seventh episode of the tenth series of Doctor Who produced by BBC Wales. The episode saw Bill make a deal with the Monks to help the Twelfth Doctor regain his eyesight, having been blind since TV: Oxygen, in which he was exposed to the vacuum of space. CONTENTS[show] SYNOPSIS edit At a war zone in Turmezistan where American, Chinese, and Russian armies are about to meet, a 5,000-year-old pyramid stands. It's very strange, but one thing raises the suspicions of the United Nations: it just appeared overnight. The aliens inside claim that humans would cause the death of all life on Earth. Soon, the Twelfth Doctor, Bill and Nardole are facing an invasion the likes of which they have never seen before. Before they invade, the aliens need the permission of humanity. PLOT edit to be added CAST edit The Doctor - Peter Capaldi Bill - Pearl Mackie Nardole - Matt Lucas Secretary General - Togo Igawa The Commander - Nigel Hastings Colonel Don Brabbit - Eben Young Erica - Rachel Denning Douglas - Tony Gardner Ilya - Andrew Byron Xiaolian - Daphne Cheung Monk - Jamie Hill Voice of the Monk - Tim Bentinck UNCREDITED edit Penny - Ronke Adekolouejo CREW edit to be added REFERENCES edit SCIENCE edit Agrofuel Research Operations uses EC 07, EC 31 and EC 46 to genetically modify R. planticola. They have been experimenting with the bacteria for at least 26 days. Douglas is also working on Experiment 7C1677, Enzyme C36 and Culture 14578. The Doomsday Clock is mentioned as having been started by some atomic scientists in 1947. LOCATIONS edit Bill and Penny are at the pub. Bill and Penny go back to Bill's flat. The Doctor, Bill, Nardole and the representatives meet up in a base in Turmezistan. The Doctor's office is mentioned. As the windows aren't big enough, the UN had to break down some of the wall to get the TARDIS out. Bill is wearing a jacket with Okinawa printed on it. Agrofuel is located in Yorkshire. The Doctor mentions Chasm Forge. TECHNOLOGY edit Penny mentions the computer simulation. Penny says she's getting an Uber to get home. The UN car's driver is called on his iPhone. Boat One is boarded again. The Doctor plays his electric guitar. The Doctor uses his sonic sunglasses which have once again been modified to give him very limited spatial information; enough to identify structures and data involving individuals present with him (age, height, etc), but not enough for fine details, such as reading the numbers on a combination lock. The UN sends of a USAF B52 towards the Pyramid. The pilot "maydays" Red 12. Agrofuel uses Bowes brand computers. Citizens in Turmezistan use cameras to photograph the Pyramid. The UN military uses guns. The UN uses Defender 110s. Russia tried to use a missile from a submarine against the Pyramid. GriffinFinder is a search engine. The Monks used a simulation machine. The Doctor tells the people at the meeting to go use Google. ORGANISATIONS edit The Doctor is recruited by the United Nations. The Doctor mentions UNIT and UNIT HQ. The Doctor pays a visit to the Agrofuel Research Operations. BIOLOGY edit Bacteria are being researched in Agrofuel. Xiaolian mentions flu and plague as possible ends to the world. The Doctor mentions GM (genetically modified) bacteria. Erica says the greenhouses at Agrofuel are full of Ethanol. SPECIES edit Bill thinks the Monks are vampires. PEOPLE edit Bill and Penny laugh about the Pope being in Bill's flat. Bill calls the President "orange". Douglas has messages on his iPad from Terry Beyer-Rees (Head of Research), Dr Patel, J. Plant, P. Spriggs, Dr Sherives, K. Moore, P. Hilton, Dr D. Newton, Dr Palmer, S. Lamont and M. Henshaw. The Doctor thinks Erica calls him God when she says "Oh my God". The Doctor says "By George". Biological data edit According to the sonic sunglasses, Bill is female, 26 years old, 167.6cm tall, weighs 130.2 pounds, has a resting heart rate of 79BPM and a body temperature of 37.6 degrees Celsius. Nardole is male, 237 years old, 167.7cm tall, weighs 216.1 pounds, has a resting heart rate of 78BPM and a temperature of 30.3 degrees Celsius. Discounting River Song, whose status as a companion is a matter of debate, this data makes Nardole the oldest known companion to date. The Secretary General is male, 70 years old, 165.2cm tall, weighs 140.1 pounds, has a resting heart rate of 68BPM and a temperature of 37.9 degrees Celsius. Xiaolian is female, 41 years old, 167.0cm tall, weighs 126.7 pounds, has a resting heart rate of 76BPM and a temperature of 37.7 degrees Celsius. Don Brabbit is male, 59 years old, 177.6cm tall, weighs 141.0 pounds, has a resting heart rate of 69BPM and a temperature of 38.0 degrees Celsius. Ilya Svyatoslavovich is male, 70 years old, 186.7cm tall, weighs 176.4 pounds, has a resting heart rate of 72BPM and a temperature of 37.6 degrees Celsius. The Commander is male, 63 years old, 176.7cm tall, weighs 176.3 pounds, has a resting heart rate of 75BPM and a temperature of 37.6 degrees Celsius. One Monk has a height of 204.6cm and a weight of 93.5 pounds. Another has a height of 214.3cm. The glasses are unable to detect their ages. FOOD AND BEVERAGES edit Bill and Penny are drinking wine. Bill: white wine, Penny: red wine. Erica and Douglas drink coffee. Water is being drunk during the meetings in the base. Nardole mentions air, water, food and beer, as basic necessities. EVENTS edit The Doctor says that they are against World War III. @TinDogPodcast reviews #DOCTORWHO 2017 - EP06 #Extremis "Extremis" is the sixth episode of the tenth series of the British science fiction television series Doctor Who. It is written by Steven Moffat and was broadcast on 20 May 2017 on BBC One. "Extremis" received extremely positive reviews from television critics, with many praising Peter Capaldi's performance and Steven Moffat's script, though some commented on the complicated script. The Vatican calls upon the Doctor (Peter Capaldi) to investigate the Veritas, a book for which its readers typically kill themselves after reading it. When the Veritas is translated and leaked online, the Doctor must uncover the dark secret that the book holds. It is the first of three loosely connected episodes called "The Monks Trilogy". @TinDogPodcast review of "Oxygen" Charles Palmer Jamie Mathieson 13 May 2017 Nardole accompanies the Doctor and Bill to a space station to answer a distress call. Most of the crew have been killed by their smartsuits, robotic spacesuits capable of independent movement which are the only source of oxygen on the station, forcing the TARDIS crew to don spares. The suits received an order to "deactivate organic components"; some crew survived by being disconnected, but networked suits can transmit the command by touch. Bill's suit malfunctions, forcing the Doctor to give her his helmet to save her, exposing himself to the vacuum of space, which blinds him; he later leaves her behind to be electrocuted, knowing her suit hasn't the power for a lethal shock. The algorithm used by the company determined the crew were inefficient and thus too expensive to keep alive. He wires the survivors' life signs to the station so that if they die it will explode, making it more expensive to kill them, so the suits give over their remaining oxygen. Bill is revived, the Doctor's eyes are repaired, and the survivors return to their head office to complain. Back at the university, the Doctor reveals to Nardole he is still blind. Review by @TinDogPodcast This title was released in May 2017. It will be exclusively available to buy from the BF website until June 30th 2017, and on general sale after this date. Every action has consequences. One confrontation, one punch, one bullet - something as simple as a gesture on a train - all can change the course of history. British diplomat Dr Philip Raven knows the world is on a knife edge. But he is about to see how history might have played out differently. How there could be a better future for those who dare to grasp it. An emissary from that future has come to show him... The Shape of Things to Come. Producer David Richardson Script Editor Matt Fitton Executive Producers Jason Haigh-Ellery and Nicholas Briggs Written By: HG Wells, dramatised by Guy Adams Directed By: Lisa Bowerman Cast Nicola Walker (Jane), Sam Troughton (Raven), Ewan Bailey (Arden Essende), Simon Greenall (Hooper Hamilton), Eve Webster (Moira Caruso/ Anna), Duncan Wisbey (Titus Cobbett), Stuart Milligan (Benito Caruso). Other parts played by members of the cast. Bill and five students (Shireen, Pavel, Harry, Felicity and Paul), seeking to room together, take an offer by an elderly Landlord for a large mansion at very low cost, as long as they do not enter the tower. Bill gets the Doctor to help with her move. The Doctor insinuates himself among Bill's friends, to Bill's consternation, but is troubled by the numerous noises the house makes, including knocking back when the Doctor knocks on the walls. As night falls, the knocking noises grow, and Bill's friends start to disappear. All the exits from the house are sealed tight, preventing any of them from leaving and separating the remaining ones. Bill and Shireen see Pavel half-absorbed in the wall, and the Landlord appears, striking a tuning fork which causes Pavel to disappear completely. The Doctor discovers the house's woodwork infested with insect-like creatures he calls Dryads. They are responsible for drawing the others into the woodwork prior to consuming them. The Doctor and Harry soon find evidence that every twenty years, a new set of students have been brought to the house to feed the Dryads. The Landlord arrives and admits that he needs the Dryads to keep his daughter Eliza alive in the tower. The Doctor and Bill converge on the tower, finding Eliza's body is now made completely of wood. The Doctor determines that the Landlord is actually Eliza's son, a memory long forgotten. As a boy, he had brought his terminally-ill mother some dormant Dryads he found, unaware of their power. When they heard a high-pitched sound from her music box, they awoke and started turning Eliza to wood to stave off her illness. Since then, the Landlord has controlled the Dryads to keep Eliza well while signing on new tenants to become the Dryads' source of nourishment. Eliza is dismayed to find she has been "living" for so long without an actual life outside the house. Being able to control the Dryads, Eliza takes the Landlord into a hug, over his objections, and thanks the Doctor before having the Dryads consume them, while also reconstituting all of Bill's friends. The group escapes the house before it collapses in on itself. Back at the university, the Doctor offers to take over watch of the vault from Nardole. The sounds of a piano can be heard coming from inside as the Doctor enters to have dinner with the prisoner inside. Continuity When talking about the Time Lords, Bill asks "Do you wear robes and big hats", to which the Doctor replies "No, big collars mostly". This is a reference to the classic series when Time Lords did wear large collars with their robes, which were introduced in The Deadly Assassin. The Doctor also inadvertently mentions regeneration, but then quickly changes the subject. Outside references Bill is called out for having a Little Mix playlist by her roommates. The Little Mix songs "Black Magic" and "Weird People" are played during the episode. Production The read-through for the second production block of the tenth series took place on 18 July 2016, and filming began on 1 August 2016, starting with the third episode of the series, "Thin Ice", and then the fourth episode, "Knock Knock". The episode was originally titled "The Haunted Hub". The Fields House in Newport served as the mansion in this story; it had also been used for the Wester Drumlins house in the episode Blink. David Suchet stated he "completely freaked" when he realized on the third day of filming that his family had rented the exact same house the Christmas before for the holidays. In an earlier version of the script Harry, one of Bill's friends, was to be revealed as the grandson of a previous companion of the Fourth Doctor, Harry Sullivan, but this scene was later dropped from the final script. Broadcast and reception After the episode was first broadcast, people in the UK could view a binaural version of the episode on BBC iPlayer. The episode was watched by 4.32 million overnight, up a half-million viewers from the previous episode, "Thin Ice", and the highest-viewed story overnight since the series opener "The Pilot". It received an Appreciation Index score of 83. Critical reception Professional ratings Review scores Source Rating Rotten Tomatoes (Tomatometer) 85% Rotten Tomatoes (Average Score) 7.39 The A.V. Club B+ Entertainment Weekly B+ SFX Magazine  TV Fanatic  IGN 8.7 New York Magazine  Radio Times  "Knock Knock" received mixed reviews from critics, receiving criticism regarding the strength of the writing, but praise on the quality of the performances in the story, particularly Suchet's. "Knock Knock" holds a score of 85% on Rotten Tomatoes, the site's consensus reading "A bit of narrative weakness aside, "Knock Knock" is a wonderful mix of nostalgia, horror, humor, and monsters that culminates into a powerful and emotionally complex episode."